Let's play with tie neck blouses. They are so feminine and easy to throw on and go. The detail that comes with this style makes it easy to add some stud earrings and walk out the door. Well, pants too, remember to add pants. While there are tons of tie neck tops out there, the ruffle detail is the perfect ingredient to add to this delicious recipe. Such a sweet color and pattern, but pair it with black jeans and booties and you can really have some fun with this top. A great neutral top for work or play. I also love the bell sleeve detail. 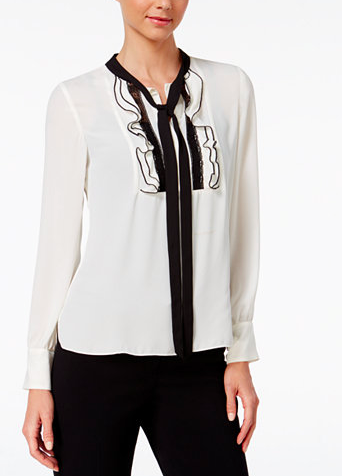 This top has a streamlined tuxedo shirt detail which is great to dress up or down with jeans or a suit. This top is a four season top in your closet. Think about it. Wear it with a pencil skirt in the summer or pair it with jeans and a cardi this winter. 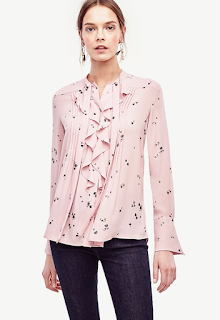 No matter your style, a tie neck blouse is a great staple. Add these ruffles, and wow, you've got a great look!